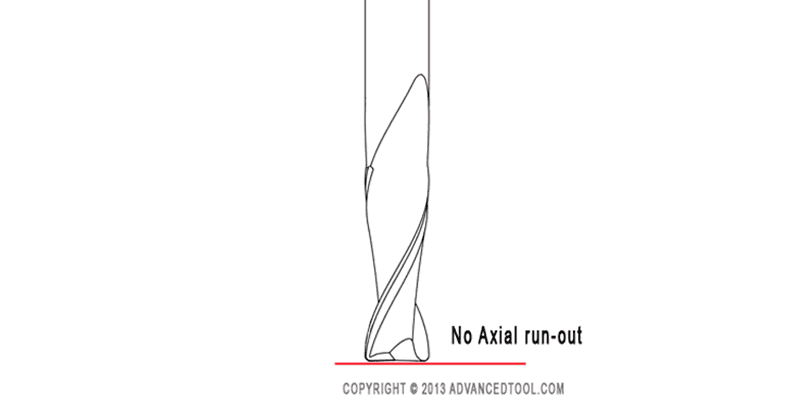 What is End Mill Run-Out? 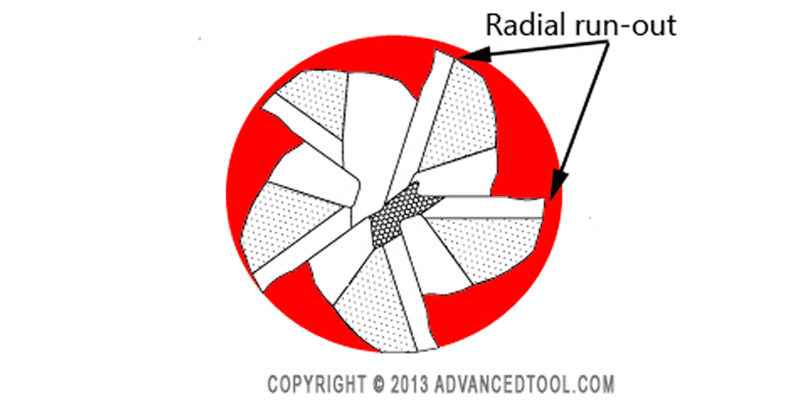 Run out is differences or variations in the diameter of a cutting tool at certain points along the outside edge while the tool is rotating. When an end mill is in rotation it is important that each tooth hits at the exact same spot along the work piece. If one tooth is hitting the work piece more than the others then that tooth is doing the bulk of the work. This will cause the end mill to wear and breakdown more quickly. 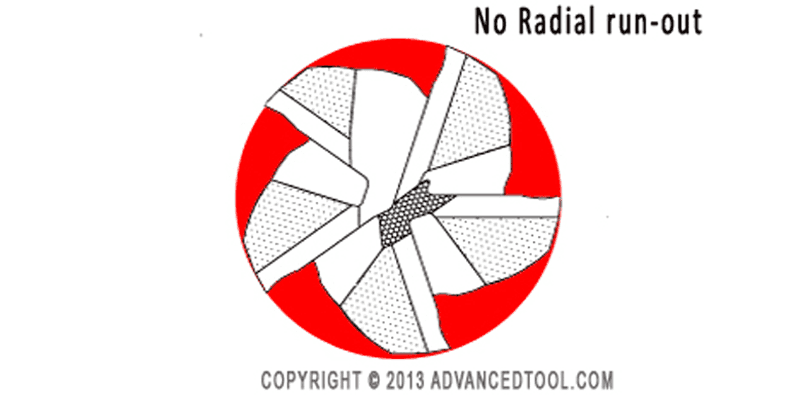 The picture to the below shows a 5FL End Mill with no radial run-out. You can visually see that each tooth is touching the outside circle at the same spot along the edge. This next picture shows an end mill with radial run-out. You can see that only some of the teeth are touching the outside edge of the circle. This end mill would not perform properly in production. The two teeth with the arrows would hardly be working during production, causing the other teeth to wear prematurely. This would make it impossible to reach optimum tool life. The picture to the left shows a 2FL end mill with no axial run-out, meaning each end tooth of the end mill would be touching the work piece at the exact same spot. This next picture is a 2FL end mill with axial run-out, meaning that one end tooth is touching the workpiece more than the other. This again would cause the one tooth to work harder than the other, causing this end mill to wear more quickly. The biggest culprit of end mill run-out is mass production and failure to pay attention to detail during the manufacturing process. It is critical that the carbide blank be held perfectly concentric during manufacturing otherwise you will grind run-out right into the end mill itself. While end mill run-out does happen, especially in lower end brands. It is more common to find run-out within the spindle or the holder of the machine tool. It’s best to rule those out first. 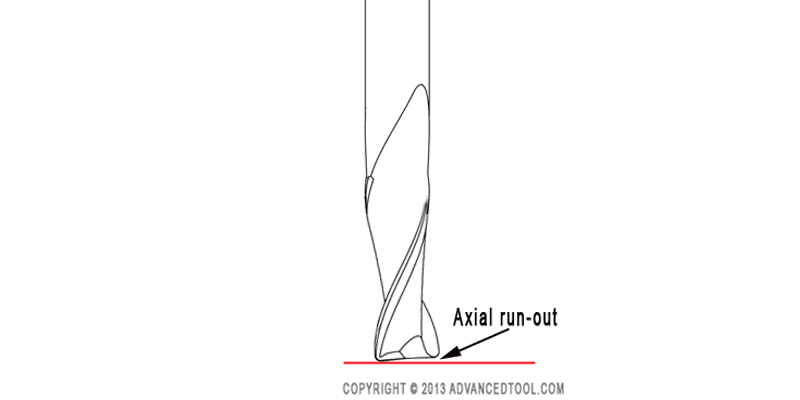 Controlling run-out in milling is critical to maximize tool life and reduce cost per part.